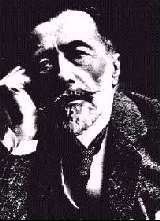 Joseph Conrad was born Józef Teodor Konrad Korzeniowski in 1857. His father, Apollo Naliecz Korzeniowski, was a poet and Polish patriot, and a radical "Red conspirator." He and Conrad's mother, Ewlina Bobrowski, were exiled to a gulag in Northern Russia, taking young Józef with them. Conrad's mother died of tuberculosis in 1865 and his father worked as a translator from English and French into Polish. In 1969 he also died of tuberculosis, but not before encouraging in Conrad a love of literature and knowledge of several French and Polish classics. Conrad became a ward of his mother's brother Tadeusz Bobrowski, who provided for his education in Cracow and Switzerland until 1874. At this time Conrad left school (with the continued financial support of his uncle) in order to pursue his dream of becoming a sailor. He began his career on the sea, which was to last twenty years, as a passenger on the Mont-Blanc, and continued on to gun-running. During these years Conrad attempted suicide, for reasons debated by various sources. Some say it was due to heavy debt incurred at Monte Carlo which Conrad tried to cover up by claiming to have been involved in a duel over the affections of a woman. To avoid being enlisted by the French navy, Conrad left Marseilles by signing on to a British freighter. He arrived in England in June of 1878, speaking only a few words of English, and continued to work as a seaman for the next sixteen years. In 1886 he was made a British subject and attained the position of master mariner. When his uncle died in 1894 Conrad's sea career also ended, and thus at thirty-seven he turned his attention to writing. Around this time he changed his name to the more easily pronounceable Joseph Conrad. He took up work on Almayer's Folly, which he had begun years before, and it was published in 1895. In that year Conrad also married Jessie George, with whom he had two sons. In the following years he wrote a number of novels, memoirs and short stories, although writing was not an easy enterprise for him. His best known novel, Lord Jim, was published in 1900. Conrad's critical success as an English prose writer is particularly impressive considering that English is his fourth language. Conrad's adventures were often represented in his fiction (for example his journey to the African Congo is recorded in his story "The Heart of Darkness"), but not merely for the purposes of providing exotic story material. Rather, Conrad utilized his experiences as a backdrop to the themes central to his writing, such as inner battles between good and evil. The settings at sea which he favored served as a vehicle to isolate the characters and their inner journeys. Interestingly, Conrad refused an offer knighthood from the Prime Minister Ramsay MacDonald in 1924. In that year he died near Canterbury at age sixty- six.